The risk for diabetes increases as we age and the only way to control it is maintaining a healthy and balanced diet. Uncontrolled sugar levels may lead to complications like heart disease, nerve damage and kidney problems. 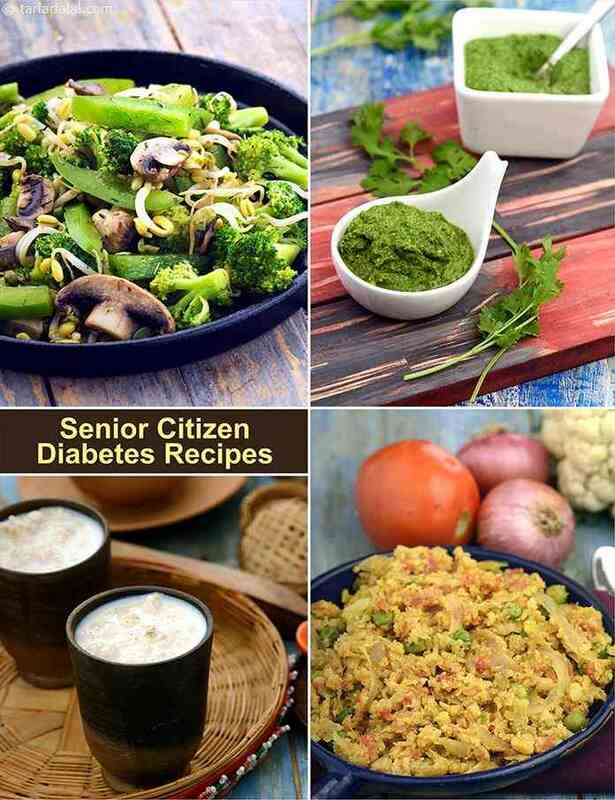 It is tough to choose the right diabetic-friendly foods as we age, thus we thought of creating a section purely for senior citizens with quick and easy day to day recipes. These can be easily prepared within the comfort of your home and use locally sourced ingredients. Include whole grains such as ragi, bajra, barley, oats, broken wheat, brown rice as these are high in fiber and will help maintain blood sugar levels. Try Bajra Khichdi and Nourishing Barley Soup. Make use of oils such as olive oil, flaxseed oil, rice bran oil instead of butter, margarine and ghee. Keep a tab on the oil used daily. Restrict it to not more than 3 to 4 teaspoons a day. Aerated drinks and beverages such as sodas, soft drinks, contain lot of added sugar and are high in calories. Turn to them occasionally. Restrict starchy food such as sweet potato, potato, purple yam and yam as they can easily increase blood sugar. Maida, cornstarch are completely refined and with no fiber which can cause weight gain and can be converted to fat if not burnt. They tend to raise blood sugar levels instantly. Avoid fruits such as banana, grapes, custard apple, chickoo and mangoes as they are high in GI.